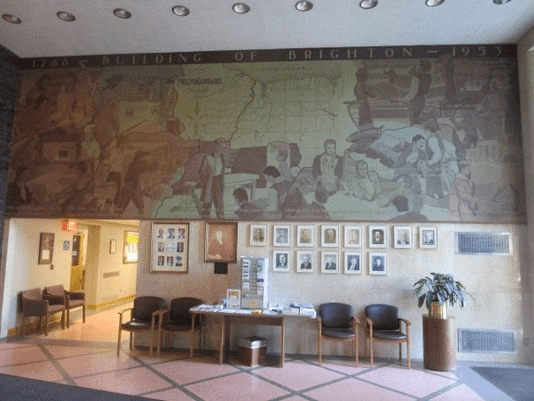 Having grown up in Brighton and living here many years, I have often seen G. Lee Trimm’s (1912 – 1976) 1957 lobby mural in the Town Hall depicting the history of Brighton from the early Native American inhabitants (apparently labeled as migrated Eskimos) to the opening of the first Town Hall in 1953, a Boy Scout beaming at the event. From Camillus near Syracuse and whose World War Two murals can be seen at the Onondaga War Memorial, Trimm’s artistic mastery is apparent in both its sweeping grandeur and finely wrought details. Only recently I looked more closely, perhaps because this Fourth of July I reflected on the ever diverse community that Brighton is becoming. 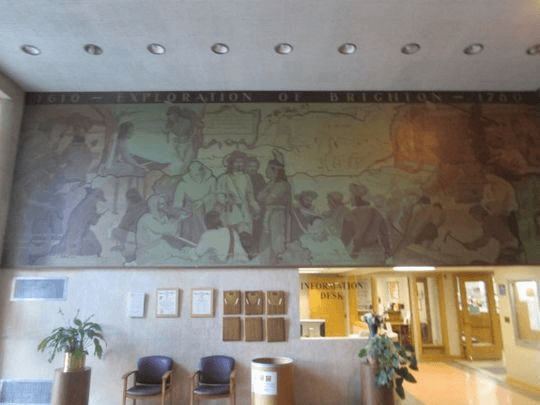 From this standpoint, Trimm’s mural is an acute barometer for the sea change of progress that has transformed Brighton and all of America over the last sixty some years. In Trimm’s pictured world, there are no synagogues, mosques or multicultural soccer games at Buckland Park. When my Meadowbrook home was built in the 1920s, property deeds contained explicit restrictions prohibiting selling to Jews and African-Americans. In 1957, some promotional literature advertising Meadowbrook still contained not-so-subtle characterizations of “desirable” homeowners. While Jews, African-Americans and other non-WASP ethnic groups were not necessarily explicitly mentioned, the coded message was clear enough. From what I have heard, in 1957 there was not a single African-American home owning family in Brighton. But first my eye looked backward further in time to the depictions of Native-Americans, who by 1957, have been vanished for almost two hundred years. 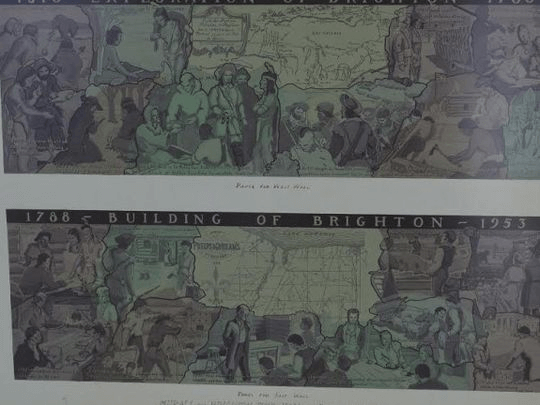 A while ago, I also wrote on Carl W. Peters’ WPA murals (1942) in the Charlotte High School. Ultimately, perhaps most interesting is how Trim imagines the place of women in Brighton history. There are only four women, each in the role of housewife and mother. The men fittingly are tilling, surveying, building cabins, hauling produce to the Bay, digging the Erie Canal, legislating, teaching an only boys school as did Master Turner in 1802, and even riding the first slow moving train in 1840. Strikingly (if not glaringly) only one of the women faces the viewer. Another is a tiny figure way in the background greeting her husband at the door of their modest log cabin. The other two have their backs and bonnets to us as they gaze–in separate spheres–at laboring men. And where does Sandra Frankel come in, you wonder? Today I had the chance to look at the mural with Frankel, Brighton’s first woman Town Supervisor (1991 – 2011) and now the Democratic candidate for County Executive. When you look at the mural and the pictures below of the other Supervisors in the town’s 177 year history, you see a distinct line of (white) men finally punctured by the photograph of Frankel. And run it well she did. Look no further than the Olmstead-like creation of parks, large and small, dotting the town. 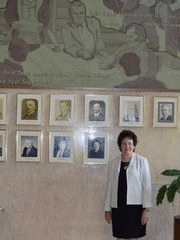 More fundamentally, Frankel “set an expectation for diversity in the town work force.” During her tenure, more women and minority candidates were hired in the Parks and Highway Departments, the police force, and in Town Hall finance and management positions. This progress was, of course, also in concert with wider social transformations. Nonetheless, Frankel–as the first to break a glass ceiling in her fair sized town where she was elected again and again for twenty years–played an important role in moving 1957 Brighton into 2015 Brighton. And during Frankel’s time, Brightonians have seen their first woman County Executive. And in January will see another.